On the 1st October 2015, Regulation Part Q became applicable to newly built dwellings in England. Part Q covers the standards for doors and windows to resist physical attack by a burglar. It includes standards on being both sufficiently robust and fitted with appropriate hardware to provide reasonable provisions to resist unauthorised access to any dwelling or any part of a building from which access can be gained to a flat within the building. 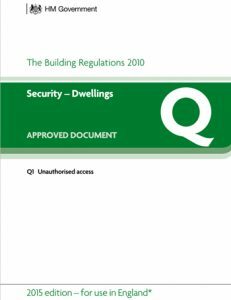 All easily accessible doorsets, including garage doors that provide access into the dwelling should be secure doorsets in accordance with paragraphs 1.2 – 1.4 of Approved Document Q1. Ground floor, basement and any other easily accessible windows, including rooflights should be secure windows in accordance with paragraphs 2.2 – 2.3 of Approved Document Q2.